The Blueprint Method utilizes a fully integrated engineering approach to quickly and efficiently execute your project with exceptional precision and cost certainty. 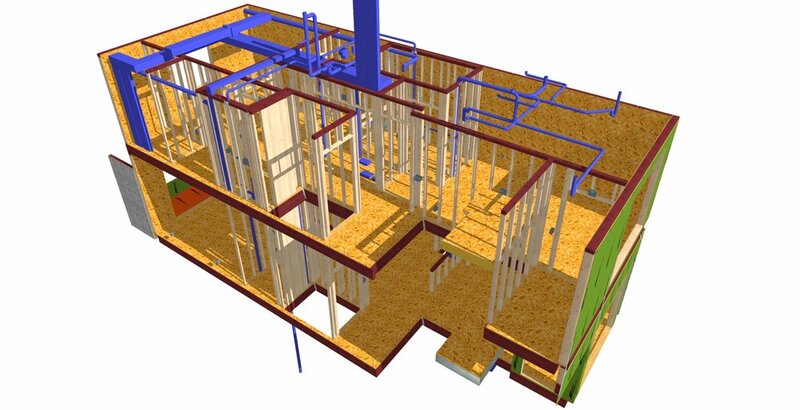 We work with your architect and engineering team to execute your design using our coordinated approach. By virtually constructing your project prior to manufacturing, we eliminate system conflicts frequently experienced in traditional building methods. Your current permit process does not change with The Blueprint Method. Once your designs are finalized, we convert your project to machine files that drive our state-of-the-art robotic equipment. By working in a climate-controlled facility, we remove the risk of weather related construction delays. We deliver your project components using a standard sized over-the-road trailer, eliminating the need for oversized transportation requirements. The Blueprint Method is compatible with any foundation solution. Upon your completion of the foundation, highly trained crews quickly and efficiently assemble your project. Once assembled, you can begin your roofing, exterior facade, insulation, drywall, and final finishes. When you are ready, we return for electrical, plumbing, and fire protection trim as well as HVAC commissioning.